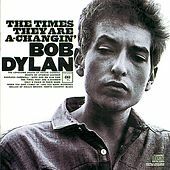 Dylan may be channeling Woody Guthrie on the album cover, but this is his first LP of all original material. The guy was barely old enough to shave, but he's reeling off striking singular songs that somehow sound as if they've existed forever. Along with the title track, almost every single one of these tunes quickly went on to become widely covered pop standards.